It’s that time of year again! How quickly it comes around… Three weeks from now I’ll be back at the London Coffee Festival for the third year running. Once again, the Festival will grace the Old Truman Brewery in Brick Lane this time from Thursday, 30th April to Sunday, 1st May. For those who don’t know, the London Coffee Festival is the launch event of UK Coffee Week and is the UK’s leading coffee festival. Spread across a number of festival zones and with 18 areas of activity, there’s food, music, art and, of course, coffee! If you’ve been before, it should all be very familiar, with industry days on Thursday and Friday and three-hour consumer sessions on Friday evening, Saturday and Sunday. If you haven’t been, take a look at my round up of last year’s festival, where you’ll also find links to five themed posts I made on my experience with cups, kit, food, competitions and, finally, the coffee. My first piece of advice is that if you want to go, get your ticket now since they are selling fast. With that caveat in mind, I present my preview of the London Coffee Festival 2015! You can read my preview after the gallery, a short high-light reel from last year. Click on the pictures for more information. So, where best to start when it comes to the London Coffee Festival? Well, the first thing to do is head over to the London Coffee Festival website, which is packed full of information on what’s going on, but not before you’ve had a look at my personal highlights. Let’s start with the True Artisan Café, a pop-up coffee shop, which, each session, features three of the country’s top roasters/cafés. Instead of having to wander the country to try them all (that’s my job, by the way: hands off! 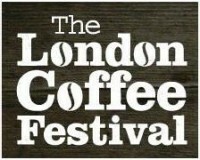 ), the London Coffee Festival brings them to you, all under one roof. Alternatively, check out the festival website and make your own selection! The UK Barista Championships have always been a big draw for some. However, for various reasons, the UKBCs aren’t at the London Coffee Festival this year. Instead, they’ve been replaced by the exciting, new Coffee Masters competition (see the Coffee Masters page for details). The other thing that I’m really looking forward to is the Man vs Machine competition, where the best roasters in the UK are challenged to make their own coffee by hand and compare it to Alpha Dominche’s Steampunk Machine! To find out who’s up for the challenge, check out the Man vs Machine page. Some tips that I learnt from previous years. While there is plenty of coffee to be had and the Street Food Market will keep you amply fed during the day, take a lot of water with you! I’m not joking here; even though I was forewarned last year and took water with me, it wasn’t nearly enough. This being a coffee festival, it’s very easy to get dehydrated if you’re drinking lots of coffee. It also gets very hot and humid in the Old Truman Brewery and, unless things have changed, there’s no water easily to hand. The other thing is that there is no cloakroom, so unless you want to be lugging your backpack around all day, don’t bring it with you! Perhaps the most important question is, when to attend? Thursday and Friday, the industry days, are probably best avoided, unless you’re in the trade. That leaves Friday evening, plus Saturday and Sunday. Friday evening (five o’clock until eight o’clock), has the bonus of the launch party afterwards (eight until ten), while on Saturday and Sunday, the days are split into three 3-hour sessions: Brunch, Lunch and Teatime. Since your ticket covers you for just one session, you need to choose carefully. If it was me, I’d check out who is on the True Artisan Café in the various sessions and make my choice accordingly, but you may have different priorities. My final tip: don’t try to do too much. There’s so much going on and while I attended three whole days last year, I didn’t get around to everyone I wanted to. I suggest you pick one or two things that you really want to see/do and do them justice. I’ve been meaning to book for some time, thanks for the warning! You’re welcome! When are you going?